Do you know the 7 times when you should and shouldn’t be aggressive? Whether your team has speed or not, make sure you know when you should and shouldn’t be aggressive. 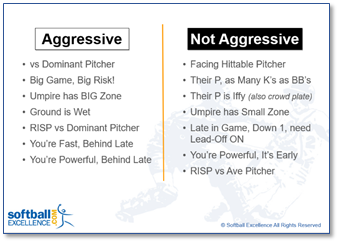 Many of us think that aggressiveness comes down to how much speed your team has, or whether you’re waving runners around third, but it goes much deeper than that. There are times for all teams when aggressiveness can be your friend or your enemy. Another way to think about aggressiveness is to think of it as risk. Many factors will determine whether it’s worth the risk to make a strategic move like advancing a runner or trying a lower percentage offensive play. Whenever your team is playing a dominant pitcher your chances of getting back-to-back hits will be low, so you’ve got to take chances and be aggressive on the bases, as well as defensively being aggressive and trying to get outs you might otherwise not try. If it’s a huge game, then be brave enough to take some huge risks. Think about the recent Super Bowl and how both teams tried trick plays by using their quarterbacks as receivers. It’s hard to get much bigger than the Super Bowl. A big zone by the umpire means your hitters will have lots of strikes called against them so getting easy bases like walks will be tough. Be aggressive on the bases to move runners whenever you get the chance. The wetter it is the harder it is to throw the ball accurately, so be aggressive on offense and force the defense to do that. A lot. Anytime you’re facing a really good pitcher and get a runner in scoring position (RISP), you’ll have to take a risk to score her since the pitcher’s talent is better than your hitters, so the chances of hitting her in will be slim. Basically, whether your team is fast or powerful, when you’re behind late in the game time is running out so you’ve got to take chances. If their pitcher is very hittable by your team, then taking risk isn’t something you’ll need to do since you can hit your way to runs. If their pitcher is wild (can often be determined by her having as many strikeouts as walks), then she’ll likely put runners on base via walks, so avoid risk – especially any type of hit and run play requires a hittable pitch. A small strike zone means the pitchers will have to throw more hittable strikes, so your hitters don’t need to be aggressive with their approach outside the zone. When time is running out in a game and you’re behind by 1, you’ll need to get your lead-off batter on, so avoid any kind of risky offensive play (like swinging) and work the pitcher for a walk. If your team has power and it’s early in the game – hit. You don’t need to run into outs by taking risks. And finally, with a runner in scoring position (RISP), if you’re facing a hittable pitcher, hit. Risk is more likely to result in an out, so the less of it you need to take the more likely you are to keep your outs and pile up baserunners which puts you in position to score multiple runs. Which puts you in a better position to win the game. If you’re a Vault Classic member – all of these eClinics are already in your locker. Enjoy!